Here at Dime Racing, we are always trying to raise the bar. 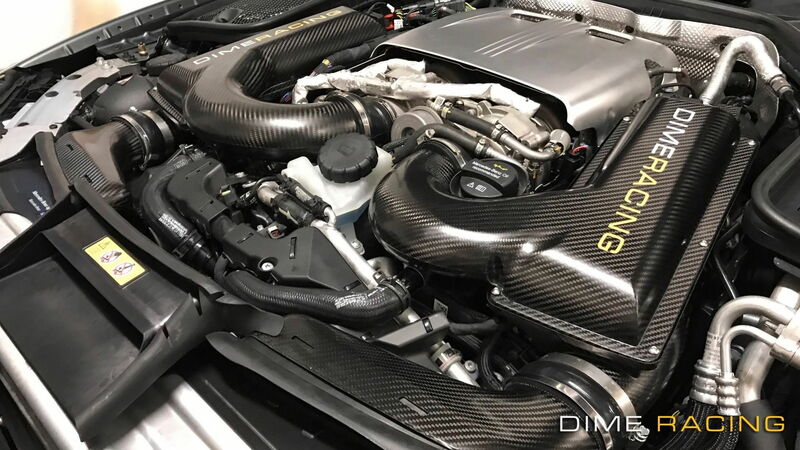 After years of testing and development, we are proud to release the latest addition to our M177 parts lineup, the Dime Racing M177 Carbon Fiber Airbox System. One of the major restrictions of the M177 engine is the factory airbox and one the common complaints with the C63 after simple modifications is the power drop at high RPM's. This power drop results in slower trap speeds. Part of the culprit is this restriction. We have developed an airbox system made completely of Prepreg Carbon Fiber that utilizes a panel filter that is over 40% larger in surface area and also has a much larger inlet cross section to feed the engine more direct air. 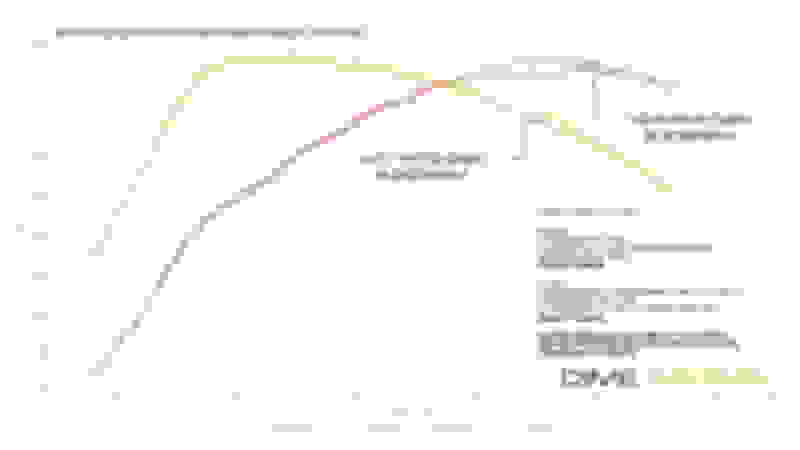 The result is gains of up to 30HP or more depending on modifications, and consistent drops in intake air temperatures due to less restriction by the factory air filter. Paired with our Turbocharger Upgrade, Competition Spec Cooling Package, and Downpipes, our customers see consistent results. For more information on our W205 C63/C63S Packages, please contact us anytime. Looks cool. Would like to see more pics and dyno sheet but $4000.00. NO WAY!! There's not an insignificant amount of R&D that needs to be accounted for to develop anything aftermarket. We as AMG owners complain about the lack of aftermarket, but vendors are continually discouraged to enter the market because of this very behavior. As for Dinan.. they're testing the waters right now with the tune. And Dinan isn't exactly known to be a 'bargain aftermarket' vendor. Agreed, though even with Dinan on the high-end, their tune will likely still cost less than this intake. Don't get me wrong, I appreciate the R&D and it's a really nice looking piece of hardware, but it's not exactly a good bang for your buck. If this was half the price and offered in something like ABS to keep costs down, I'd definitely be more interested. I've owned several BMW's before buying my AMG and both cars were heavily modded with Dinan. For the quality and craftsmanship and warranty that Dinan offers I would say that they are priced well below a lot of their competition but are still able to offer a competitive product. As for the cost of the Carbon Fiber Air box system. Eventuri makes a comparable system for the BMW F80 and Audi RS5 and those are $2345.00 and $2595.00. Still not cheap by any means but $1700 and $1400.00 less expensive. A similar air box made by Dinan for the F80 M3/M4 is $2059.00. That's half the price of the one offered by Dime. I know its not apples for apples because this is for Mercedes and these are BMW but the cars are direct competition. That's all I am saying. That's a seriously PERFECT intake for the car. Looks great, looks high quality, and I believe it'll provide all the air the M177 could ever need. Only one quote pops to mind: "More than [I] can afford, PAL"
I used to say I'd never spend more than $125 on an intake... for THAT gorgeous piece of engineering, I'd pay $1000, and that's a compliment to you guys... but I guess it's not geared towards people like me -- you're probably limiting your audience quite a bit with that price tag. Why not drop the price to something we can all afford (even if it's a stretch) and make your money off volume... not to mention your name would be in every tuned engine bay in the country. I don't see any other intakes that can match yours at this point. Hustle and get it everywhere before the copy cats come out. You heard it here first. Last edited by skim7x; 06-01-2017 at 04:09 PM. If they priced this around what Eventuri is asking $2200-$2600, count me in. I'd buy it just because it looks cool and id want to show it to people. For $4K, to rich for my blood. I can get a lot more for my money if I'm look to spend that. Since you guys are touting the stock intake as a restriction, did you do an air measurement (g/s) between stock vs your product? That simple measurement is a great way to see if there is a physical restriction. For that amount of money, I assume there were some concrete tests performed because at the end of the day, it's a filter on a stick. If you look at the pics carefully, It appears that there is a seam on the pressure side of the pipes running latitude. Not only is that odd when is suppose to be a carbon fiber pipe as a wrap would not have a seam, but over time that seam will weaken and ultimately split. Seams on the pressure side of pipes is usually a recipe for issues. pressure? I see the intake come in from the front of the hood. Then up through the filter. Then curves forward and around to the inlet of the turbos. Wouldn't the whole intake be in a vacuum, not under pressure. Am am I missing something in your analysis? So are you saying that a vacuum doesn't create pressure? I am pretty sure that's not what you meant in your post. Because you said "pressure side". And spoke about "seams". But ok. Yes a vacuum is a negative pressure. Lol. Not many balloons will pop by sucking in on them though. Aren't there two air filters on the C63? Seems a better comparison than the M3 with just one side would be the M5 (where Dinan is around $3,100). I just can't comprehend how an air intake can cost $4000. What am I getting for $4000? There's no proven information, no graphs, no dyno, etc. there's nothing. Seems like this is priced to entice the "I don't give a f*** what it costs, I need it" crowd. There's no reason it should be $4000. It's air boxes. I can't believe how much the MB aftermarket is. I was excited to do mods but with the price of everything it's not reasonable for someone like me. Yes yes, I don't make as much money as many here. I'm still gonna complain that everything is too expensive. Much like the cooling upgrade thread they throw up here, there is no before and after or any hard numbers. This, to me and it seems others, is a money grab for a product that stands alone in the market. They seem to be capitalizing on the fact that there are no current competitors. The F80 M3 has dual air boxes as well. Why blame them? Every first-to-market product will be priced at a point to figure out what the market will bear. I'm sure there will be buyers at the 4k price point. Clearly a number of folks here, including myself, won't buy at that price, and will wait for 1) price to come down or 2) a competitor comes out with a cheaper, equivalent option. As of now, few other MB tuners are even going this far with the multitudes of mods for our M17x, so why discourage it? It seems counter productive to our aftermarket health. I don't disagree with the calls for more information. But I'd let them try to address it, rather than some of the discouraging statements made. It happened in the Dinan thread, and granted it was directly addressed, and I see it happening here. I'm perhaps a bit wary because I'd like to see more vendors produce more aftermarket items for us, and that requires us as a community to stand behind the various vendors rather than immediately complain. Given this platform is already approaching three years old, yet we've not seen the vendors really push R&D for it. Then they can address it. I have my doubts that they will. Like in the thread about their cooling upgrade, numbers were requested and they never delivered. That came with a high price tag as well. R&D should also include what people would pay for something. Any other company can look this thread up and see that people are not willing to buy an intake at that price. They should no be discouraged by that. They can then set their development to target a realistic price. Like on any other platform, an intake can be produced for a reasonable price.